Deland Anderson an Alaska based Mishkalo artist who does Dot painting. Matisse once said that he wanted his art to have the effect on his audience that an easy chair has at the end of the day for a businessman – some sort of a comfort. I like that. What's the inspiration for your style of art? I grew up in Montana in a ranch. After high school, I went to the Australian outback and worked in a cattle station. There I got to meet some Australian aborigenes people who have a very different way of seeing the landscape. And I got introduced to a style of art they do in the deserts of Central Australia called the dot style, which is now my primary style. When you started painting at 31, what was the first word you did? I did a piece with my son – I had him step on a big board and painted a picture of the soles of his feet that was the central part of a folktale that my grandmother had told me. I also started painting dots on objects such as mailboxes, bicycles etc. I’d call it dot painting inspired by the Australian aboriginal style. I pursue my own direction using dots. As a child when I started drawing, I was frustrated by lines and dots work for me. I am fascinated by color. With dots, when you put one color next to another, it might create a third color in your mind that may not exist on canvas. Now I do more aerial paintings of interesting topography and horizontal horizon shots. My paintings are representational and abstract at the same time just like cartoons can be both representational and abstract. So it's similar to pointillism? Quite different. Pointillism was the precursor to pixels, you visualize an image as a set of discrete points. So, you may have many colored dots next to each other. 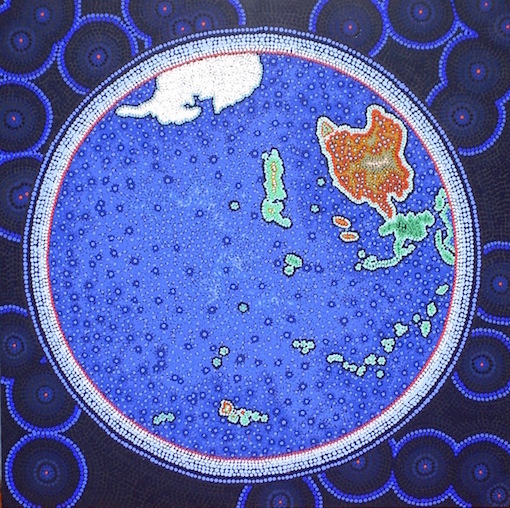 The Aboriginal dot style tries to create a patterns with dots which then become images. You’ll see dots of one color completing a pattern. I usually work one piece at a time. I start with one line or prop and go from there and build on it. With dots you cannot erase or change something, so you have to improvise as you go along. When I go to a place, I have memories of light in that place. Light is the key to color and all I have to do is to bring out the palette to use that color and bring out the light. I am married for 35 years and three grown sons. Two of them are in Alaska and and third in New Zealand. My wife and I are big ski enthusiasts and that’s why we live in Alaska. I do artist residencies in the rural villages of Alaska. I quit teaching 6-7 years ago and now am a full time artist. 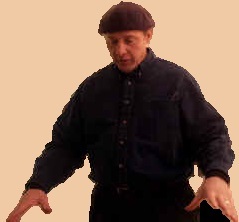 I was a professor of Philosophy and discovered art at the age of 31 years. Philosophy is all words and hates pictures, but I am fascinated by colors and images. Perhaps that’s why I don’t like to analyze my work or describe it with words. I have a great appreciation for western art but it just does not move me. I am taken in with New Zealand’s Maori art. The simplicity of its iconography is amazing and the blending of the objects are fascinating. I always have a sense of seeing where I am from above and that’s how I orient myself. The aerial and almost topographical way of painting landscapes with dots resonates with me. Aerial image of Ikpikpuk River drainage, North Slope, Alaska. This image shows the waterways of the tundra of Northern Alaska after first snowfall but before the freeze up of the rivers. Caribou calve here and for thousands of years Native Alaskans have lived with and from the caribou. 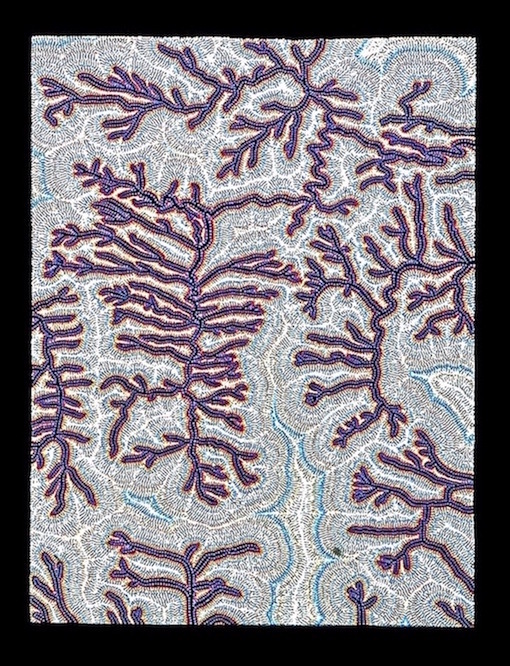 The river pattern in this work is enhanced with colors to call to mind the small capillaries left clinging to the inner side of a caribou skin. This image suggests that the world is alive, just like the organisms in a biology lab. It prompts us to think about our self-appointed role as manipulators of the environment. An unusual perspective on the planet emphasizes that we might not know what we are doing in the end.